The co-main event at UFC on Fox 8 was supposed to be a chance for the next welterweight contender to make a statement. The bout between Rory MacDonald and Jake Ellenberger figured to be an exciting bout between the two most likely men to fight for the welterweight belt after champion Georges St-Pierre and Johny Hendricks fight. Instead, MacDonald won a decision in a snooze fest. MacDonald established a jab early in the fight, and continued to use it throughout the bout. He didn't come up with big moves that could finish the fight, though. Instead, he was content to rely on the jab again and again. Ellenberger played the fight even more cautiously than MacDonald. He couldn't find a way to avoid MacDonald's jab and set up a strike or a takedown. The Division II wrestling All-American couldn't get a takedown until late in the third round. This fight was his big opportunity to get to the championship shot, but his cautiousness kept him from getting the win. The crowd was unrelenting in their boos, and even UFC president Dana White was disappointed. Alrighty..... well that wasn't the fight I thought it was gonna be!! The only positive in that fight was that the judges finally got the 30-27 right! "I obviously look to finish fights, but he’s a good fighter, so what can you do? I think I had him worried with the elbows because he didn’t want to come near me after that. 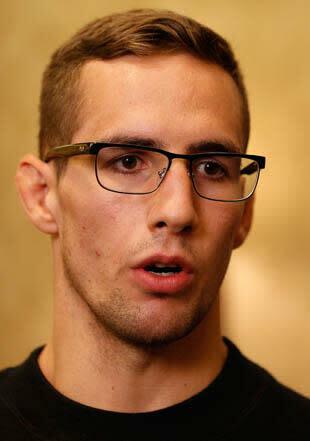 That wasn’t my game plan, but I accomplished what I needed to do," MacDonald said after the fight. Though MacDonald got the win, there is no guarantee he will get a title shot any time soon after that performance. He trains with St-Pierre, and appeared to learn from his safe, but not exciting, approach. At 15-1, he has the resume for a title shot. But will the UFC want to feature him if this is the fight fans remember? • Is Johny Hendricks the next Chris Weidman?